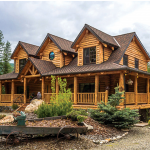 Here are a few examples of our pre-assembled log home designs from our catalogue. All of our homes are hand crafted, and our floor plans designed for comfort and livability. Simply click on the image to see the full sized image or a slideshow of many full size pictures. To see all 34 Standard plans and many more custom plans, please order our color catalogue and DVD. 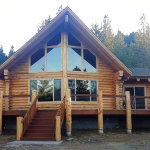 For answers to more questions about our custom log homes read Straight Talk from the Top and My Two Cents and visit our upcoming Open House. 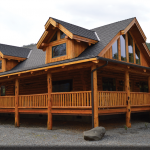 Every family who is looking for the perfect log home design for their needs, often has different ideas. The right log home floor plan will accommodate that lifestyle and also fit with the scenery that surrounds your new home. 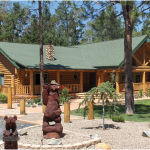 Homestead Log Homes know a thing or two about designing a workable home plan because we’ve built over 900 of them. We also can provide you with one of five onsite building programs. 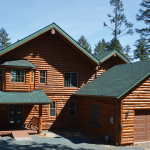 If you want a log home builder and manufacturer you can rely on to deliver both quality and style, take a look at these models below. 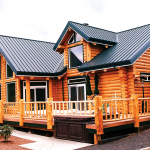 There are log home floor plans to meet almost any lifestyle and setting. For some families, a second home in the mountains is an ideal way to spend time relaxing. Some of our log cabin floor plans are ideal for a second home or for a getaway where you can spend time with friends and family. The Cub Bear is our smallest floor plan at 680 square feet with an open loft for sleeping space. The Shasta offers nearly twice the space and has a more conventional floor plan with two bedrooms and two bathrooms. Some of our more elegant and spacious log home designs such as the Valleyview and Prospect will make a beautiful place to relax, and come with a stunning cathedral ceiling. The Valleyview is a wonderful design that is ideal for larger families or anyone who enjoys entertaining. The Prospect is the traditional four bedroom and three bath design that gives your family lots of living space. Add to that the beautiful kitchen, bedrooms, game room and high stone fireplace in the great room. 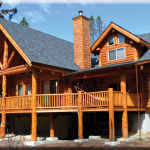 The result is a log home that will provide the ultimate in comfort and livability. If you can’t find the log cabin floor plans that are right for you, we can work with you to incorporate your ideas and create a customized home that fits your lifestyles and needs. Just browse the models and look at the floor plans and slide shows to find the features that suit your style best. Bring in sketches of a floorplan you like and we will build it.